Hello, everyone. James Mielke of Tigertron here to talk about what went into creating the Jupiter & Mars soundtrack — aka ‘an audio specimen of future Earth, vol. 1‘ — our underwater adventure game launching on Earth Day, 22 April, for PS4 and PS VR. I’ll confess that — as many people have guessed — the title of Jupiter & Mars is inspired by the 1954 Bart Howard jazz standard, ‘Fly Me To The Moon’, made famous by Frank Sinatra and, perhaps less logically, Evangelion. This was back in 2011. The words “let me see what spring is like on Jupiter and Mars” gave me an idea for two characters. How it relates to two dolphins is not something I can easily explain, but the pairing of “Jupiter and Mars” was the first spark that led me to designing the game featuring these two inseparable characters. The second catalyst was the movie The Cove, which, after seeing it, made me want to take action on behalf of dolphins, which are beautiful, super intelligent, amazing creatures that we should be protecting, not hunting. With music as my starting point of an idea, I imagine the characters, story, and cinematics and ending first, often resulting in a narrative concept fully formed before I’ve even decided what kind of game I want to make. Such was the case with Jupiter & Mars, which started with Frank Sinatra and eventually became the PS VR-compatible game you’re reading about today. The games I’ve worked on have always had music at the forefront of the experience. Child Of Eden, Lumines Electronic Symphony, and now Jupiter & Mars allowed me to assemble a soundtrack as unique as any mixtape I’ve ever slaved over. The lessons I learned when I worked at Q Entertainment in Tokyo have always stayed with me, and without a strong audio experience, I feel like the player isn’t getting a complete gaming experience. The ebb and flow of the soundtrack in a game is as important as the sequencing of songs on an album like The Beach Boys’ Pet Sounds. My equation is simple: the right sounds, for the right moments, equals memories. Choosing the right music for the right situation is what I call a “Say Anything” moment. The iconic point in Cameron Crowe’s coming-of-age epic, where John Cusack holds aloft a boombox playing Peter Gabriel’s ‘In Your Eyes’, is how I want to use music in a game. Not as background music, but as an integral part of the game experience. Enter multi-instrumentalist, Jon Atkinson, a key member of George Martin’s (The Beatles’ producer) production group, who joined the project after we first met at a Howard Jones concert in Tokyo. 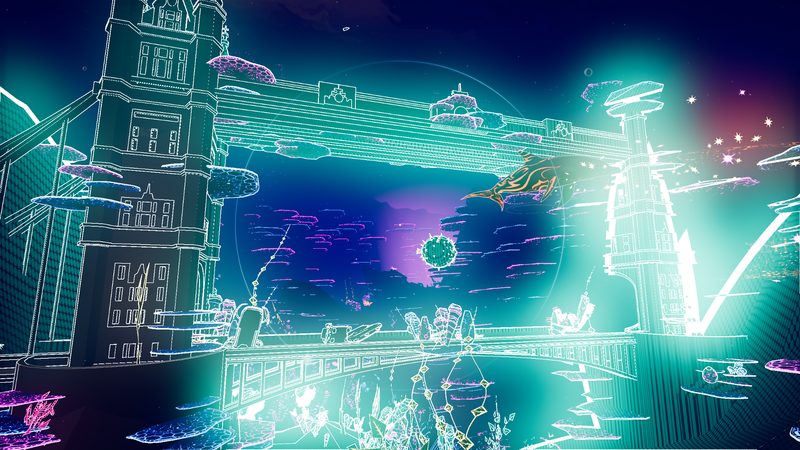 After some discussion, we decided that the deep blues and greens of this ocean world deserved to be adorned with the Moog-y synths of the Blade Runner and Tron soundtracks. Fortunately Jon was up to the task with what moods we wanted our soundtrack to evoke. 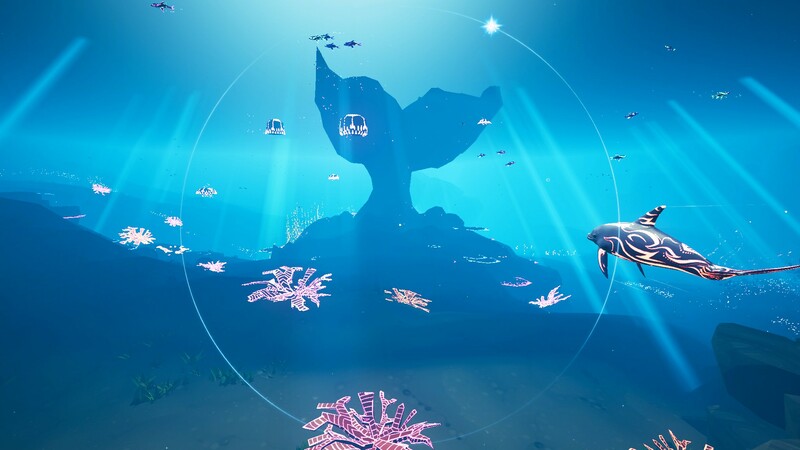 You may be surprised to hear something so distinctly synthetic in a game about two dolphins, but I wanted something that reacted to the pulse of the moment, so a documentary-styled score wasn’t going to achieve what we wanted for the game. Enter Nami Miyahara. A successful Japanese solo artist, collaborator with Japanese group Rip Slyme, anime voice actor, and vocalist for Genki Rockets (you might remember “Heavenly Star” from Lumines II and No More Heroes). I really wanted to work with her on Jupiter & Mars. Fortunately, she was eager to collaborate on this game with us. We wrote and recorded the song with her and Jon Atkinson over the course of a couple intense days in London, starting with lyrics that I wrote with Nami while wandering around Primrose Hill, and ending in a day-long recording session at the legendary RAK Studios in Camden, London. The resulting track ‘(We Are) Shooting Stars’ is an upbeat piece of pop music, with ABBA-like chord progressions and multi-tracked vocals, sung from the perspective of the female lead character Jupiter. I think it’s a catchy earworm, if I say so myself (Jon and Nami cranked out a nuanced but hook-filled melody to accompany the words), but gamers who play the game will find deeper meaning in the song’s lyrics. Although we actually recorded the song in September 2017, I met up with Nami in Tokyo just a few months ago to shoot a music video with her, a full year and a half later. Besides the tracks created by Jon Atkinson, the game features a few songs licensed from other artists. The first song, ‘Automatons’ by Anything Box, will be familiar to veterans of Lumines Electronic Symphony. While its presence in Lumines is memorable, the way it’s used in Jupiter & Mars is how I originally envisioned using it, in a pivotal scene in the game, where a long dormant industrial city awakens. I’ve known Anything Box songwriter and lead singer Claude S. since 1990, and he was super helpful in licensing the song to me again for Jupiter & Mars. Another artist who appeared in Lumines is trance legend Ferry Corsten, and his music returns in Jupiter & Mars, too. We felt that one song he’d written for his then-unreleased Gouryella album ‘From The Heavens‘ was perfect for a climactic scene in the game. So, when you hear his track ‘Anahera’, know that we knew exactly what we wanted, two and a half years in advance of when you’ll finally see and hear it in-game. That’s how important music is to the genesis and planning of our games. The final track was written for us by a Brooklyn-based keyboard wizard and session musician, Scott Wozniak. When a song I wanted to license fell through (can’t win ’em all! ), I turned to Scott and explained the context of the song and what it represents, to see if he could compose something that matched the tone of our original choice. Gentle and shimmering in its piano-led electronic pulse, I think the song “朝子” (“Morning Child”) is perfect for the game’s epilogue. Each area of the game’s soundtrack is built in layers, adding in tracks when the tension rises and subtracting them when the tension subsides. For the purpose of a soundtrack, however, we had Jonathan assemble 20 tracks as complete ‘songs’, and I’m excited to say these songs will be released digitally and on vinyl, via BraveWave Productions. The songs that won’t make the cut on vinyl due to playtime restrictions (it’s a maxed-out double album) are Jon’s version of Maurice Ravel’s ‘Bolero’, and Scott Wozniak’s track “朝子”. They will, however, be included digitally with all vinyl and digital versions sold. 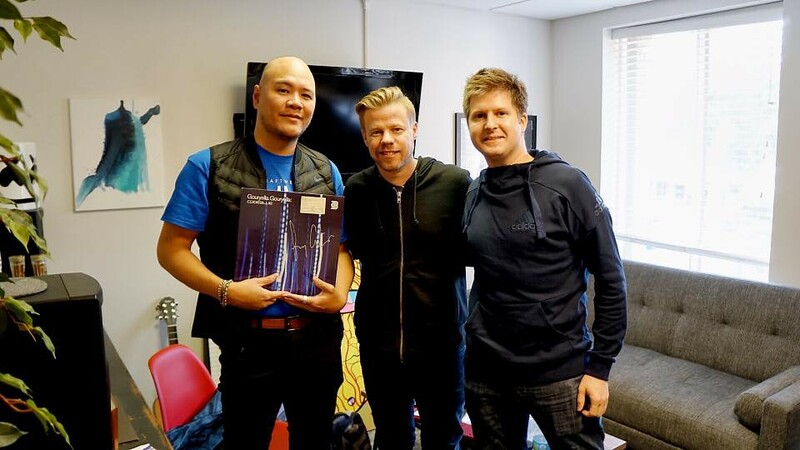 The two licensed songs by Anything Box and Ferry Corsten also aren’t included on the album proper, since you can purchase them separately via your favorite music source. Regarding the album jacket design, BraveWave Productions (our soundtrack publisher, who will be releasing the album on vinyl and digitally) enlisted Dan Clarke, aka Arkotype, an excellent graphic designer out of the U.K., to create the cover designs, and it turned out beautifully, reminding me of some of my favorite covers by New Order and The Pet Shop Boys. 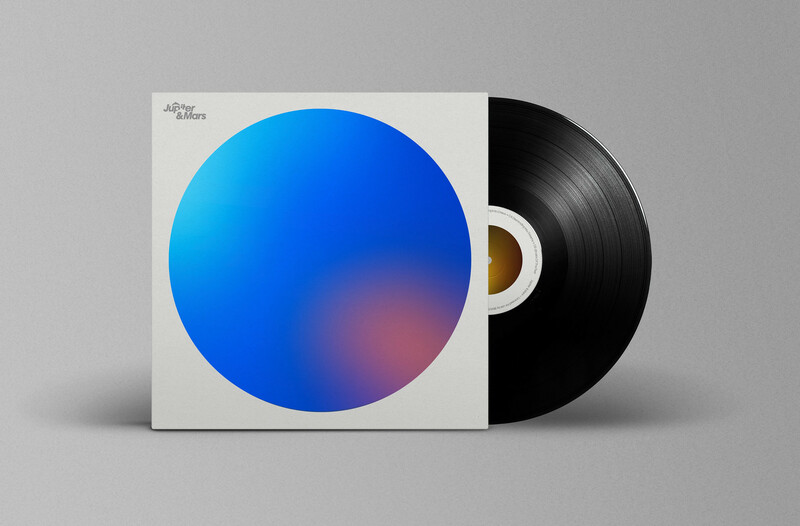 The minimal gradients in each of the album jacket’s ‘portholes’ were created from actual screenshots in the game, twisting and pushing the colours from each screenshot’s hues (themselves taken from individual biomes in the game) into one beautiful, pearlescent shape. 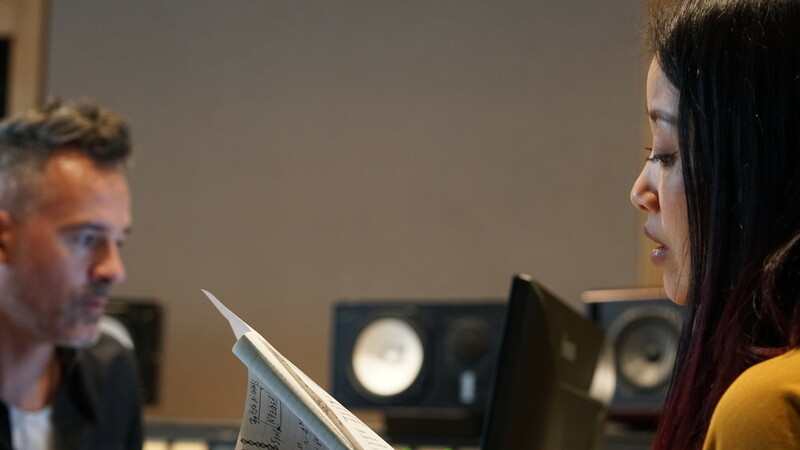 Here’s what Dan had to say about his process: “My own style has always been influenced by the graphic design culture of progressive house & trance from the 90s and early 2000s (particularly labels like Bedrock and Global Underground) — I believe that this album feels as if it could have been born in that era, so the direction for this project takes inspiration from that. This soundtrack has its own personality and identity, with that in mind I wanted to make something unique in order to make that clear. Lastly, on the topic of the vinyl release, my good friend and mentor Tetsuya Mizuguchi wrote the introduction to the album. So if you’re a gamer who likes things like Child of Eden, Lumines, Rez Infinite, and Tetris Effect, and have to own all the Mizuguchi things, this should make a nice addition to your collection. So hopefully this gives some insight as to how integral the music is in our games. Jupiter & Mars revolves around two characters who depend on each other, who share special times together, and are above all intelligent beyond our understanding. They experience emotions as profoundly as we do. In Jupiter & Mars we want to tell a mostly wordless, musical story, where the actions and deeds of our two cetaceans penetrate your heart more deeply than any text box could ever do (I hope). My personal wish, when you play our game, is that you grow as close to these characters as I have through the years. They first swam into my head almost a decade ago, and they’ve been like family ever since. Moreover, I hope that even after you power down your PS4 or take off your PS VR headset, and walk away to do something else in your life, that a bit of my friends, Jupiter and Mars, goes with you. 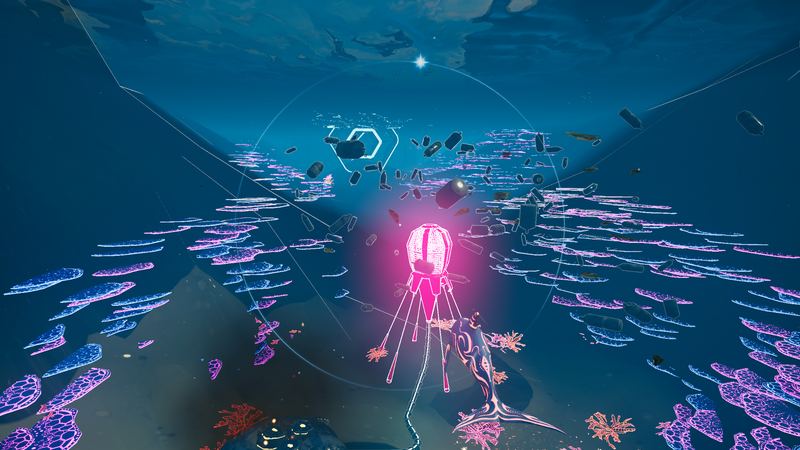 The post Take a deep dive into the soundtrack of PS4 & PS VR adventure, Jupiter & Mars appeared first on PlayStation.Blog.Europe.